The Wayward Bus. 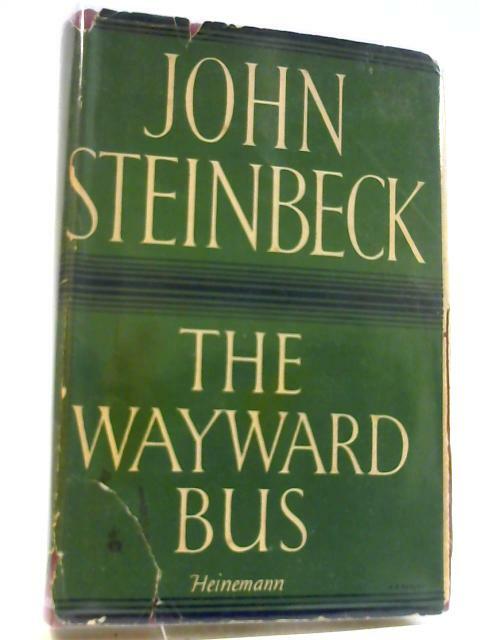 by Steinbeck, John. 1947. 254 pages. Pictorial jacket over red boards with white lettering to spine. Some internal hinge cracking. Light tanning and foxing to text pages with mild tanning, water marks and foxing to endpapers and text edges. Some pencil and ink annotations to endpaper. Scraps, small bumps and dog ears to text pages edges. Some rubbing to the board edges and wear to the spine ends. A few marks to front and rear boards. Slight lean to spine. Small bumps to corners with bumps to boards edges. Fair wear to dust jacket with tears, nicks and creases to the spine, edges and corners. Foxing and tanning to jacket with light water marks. Jacket is in removable plastic cover.